Only 17 days until Christmas. How is that possible? We've been busy trying to finish our Christmas shopping. If we're lucky, hopefully we will manage to purchase all the gifts before the end of this week. Thankfully Grandpa and Grandma volunteered their services this past weekend so we could shop without the kids. I've also been buying a few items online this year and that has made life a little easier as well. The kids both adore their battery powered toothbrushes! After an opportunity to test these out, we won't be switching back to the manual toothbrushes anytime soon. I've never seen the kids open their mouths so wide in my life. Plus they brush for longer periods than they previously did with the manual. I thought that perhaps the sound might scare them, but just the opposite happened. It's like brushing your teeth with a toy! (No lie- I have to pull my son away from his toothbrush kicking and screaming he likes it so much.) My daughter uses the Dolphin design and my son uses the Astronaut. My only complaint...I wish they were designed so that I could replace the brush head. Play silks are a must for the dress-up box and encourage imaginative play. Also, perfect to use while dancing and singing. We own the mini Rainbow Playsilk. Sarah's Silks Playsilks is a leading manufacturer. Color and bake - Shinky Dinks are a fun, creative and quick activity for home. Our craft supply box would be incomplete without a set of Glitter Glue. My kids love to add sparkle to all their projects. 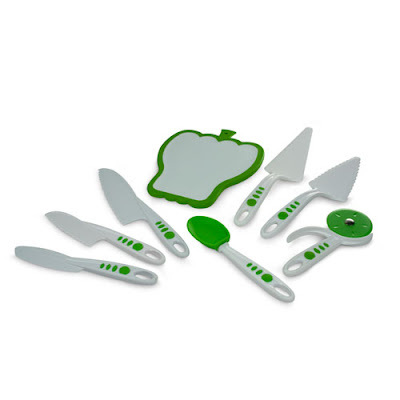 A couple months ago I reviewed the Curious Chef products here on Brimful Curiosities, and my daughter especially loves her knife set. The kitchen tools and gadgets help make cooking fun for kids. Short stories, long stories, kids create a new story every time they shuffle the deck. For a more detailed review, see my post about the Mystery in the Forest set. Books make the perfect gift for the holidays. Don't forget to include several as stocking stuffers. Some good options are the inexpensive paperbacks available in retail stores or from the Scholastic book clubs. For toddlers you can't go wrong with the Bright & Early Board Books . Looking for some great books published in 2009? Check out the list of Cybils nominations this year. Give the gift of reading!! Any other suggestions for non-toy stocking stuffer gifts? I'm always looking for ideas! Great suggestions for stocking stuffers that are fun and practical as well. My favorite suggestions are books (of course!) and also the play silks from Sarah's Silks. We've used those over the years to wrap especially large, bulky or odd-shaped gifts. A great re-usable alternative to rolls and rolls of wrapping paper. And it looks so pretty! I have two girls. 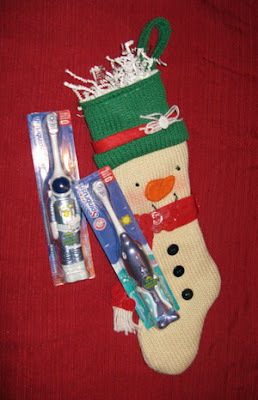 Some more ideas are chapstick or lipgloss, a little packet of holiday tissues, a fun bookmark, fuzzy slipper socks, and mittens. For girls, hair items like barrettes and bows. For boys or girls, DVDs, crayons, stamps, and card games (like Snap and Go Fish). Totally loved this post! I paid it the ultimate complement - marking it unread in my reader to savor tonight. :) My son just turned 2. A few more things I'm going to put in his stocking that I don't think you mentioned: stickers, play money (I think I'll make my own, with family members faces on it)... I'd say hotwheels cars are perfect, but he is so overloaded with them that I've put a bit of a moratorium on that at the moment. I like the idea of jingle bells in there too, but I haven't gotten any yet. The stocking already seems stuffed, and I can't remember what I bought to put in there. Oh, a giant pen (I also love oversized pencils). I bought glitter glue too but I was too excited to give it to him, so we've been using it all week! Same with new paint. :) Stuffing stockings is probably my favorite park of Christmas. I've been known to stuff my own! Just wanted to thank you for the review of the Curious Chef kitchen items! I bought some for my daughter for her birthday and am thinking of getting a few more pieces for her for Christmas! Love them! Thanks a million!